Arab and Kurdish officials announce the establishment of the Federation of Northern Syria – Rojava last night. The establishment of the new federation is being seen by many Syrians as an initial sign of the partitioning of Syria, an event they are strongly against. Kurdish citizens on the other hand see this as a new era for Kurds in Syria. The six released captives and the commander of al-Sultan Murad Division. Image courtesy of al-Sultan Murad Division. A father and two of his young children were killed by opposition shelling of al-Zaharaa neighborhood, western Aleppo. 6 opposition fighters from al-Sultan Murad Division, an opposition faction fighting against IS in northern Aleppo Governorate, were released from IS custody after a prisoner exchange deal was executed between the two factions. It remains unclear what was exchanged in return for these prisoners. SAA and IS forces clash in areas southeast of Aleppo. IS launch a counterattack against the SDF in the vicinity of ash-Shaddadi and manage to advance. Reports of 10 Kurdish casualties in the past few days of fighting in the area. 313th Brigade, an islamist opposition faction, detonated an explosive tunnel under an SAA location in Ter Maela, north of Homs. Reports of some SAA casualties. IS release footage of dead Russian military advisor killed in the Palmyra battlefront alongside his equipment. SAA close off the road between Barzeh and Damascus. Locals reported that this is due to an SAA soldier kidnapped by opposition forces in the area. JAN, 313th Brigade, and Faylaq al-Homs clash with SAA in southeastern Hama Governorate.The islamist opposition forces managed to advance and take control over some areas only to retreat soon after. Reports of casualties on both sides. SAA and IS clash in the vicinity of Sheikh Hilal, northeastern Hama Governorate. Reports of casualties on both sides. al-Hamzah Division, an opposition faction, clash with an IS-affiliated faction in Inkhil, 44 km north of Daraa. Reports of casualties on both sides. SAA and IS clash in northeastern as-Suwayda countryside. Reports of IS casualties as SAA destroy an IS heavy machine gun mounted vehicle. More than 40 humanitarian aid and supply trucks arrived in the four towns of al-Fu’ah and Kafarya in Idlib Governorate and Madaya and Zabadani in Damascus Governorate during an operation supervised by the Red Crescent organization. 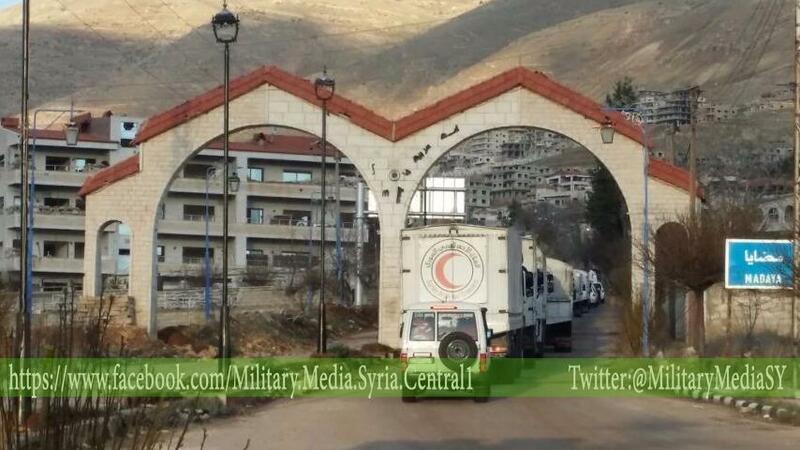 Humanitarian aid arriving in Madaya. Image courtesy of @MilitaryMediaSy. Doudyan – Aleppo Governorate: IS vs opposition forces. IS manage to advance and take complete control over Doudyan. South of Jabal Abd al-Aziz – Hasakah Governorate: SDF vs IS. Reports that IS shelling of areas south of Jabal Abd al-Aziz caused some SDF casualties. More casualties reported on both sides. Kinsabba – Jabal al-Akrad – Jabal Turkman – Latakia Governorate: SAA and allies vs the 1st and 2nd Coastal Divisions, Ahrar ash-Sham, Ansar ash-Sham, JAN, and Turkestan Islamic Party forces. Reports of 2 islamist opposition casualties in addition to more casualties on both sides. Palmyra: SAA vs IS. Reports of casualties on both sides as the SAA manage to advance in the area. Heart Hospital – al-Hawiqah Neighborhood – Deir ez-Zor Military Airport – Deir ez-Zor Governorate: SAA vs IS. Marj as-Sultan Vicinity – Damascus Governorate: SAA vs islamist opposition and JAN forces.